(CN) – A second federal judge blocked portions of the Trump administration’s travel ban on Wednesday, just a day before the moratorium was set to go into effect. U.S. District Judge Theodore Chuang, in Maryland, issued the hold on Tuesday, momentarily blocking the administrations’ ban on individuals coming to the U.S. from eight nations including Iran, Libya, Syria, Yemen, Chad and Somalia. Judge Chuang retained aspects of the ban which bar those coming to the U.S. from North Korea, business officials from Venezuela and those who fail to prove a credible claim of a relationship with a person or organization inside the U.S.
On Tuesday, Hawaii District Court Judge Derrick Watson temporarily blocked the Trump administration’s third try at a workable travel ban, finding it just as discriminatory as the first two versions. Huang’s ruling mirrors the Supreme Court’s decision in June which reviewed two cases challenging the ban on individuals hailing from six Muslim-majority countries. The high court opted to reinstate the ban but made exceptions for those with bona fide ties to a person or business in the U.S.
Judge Chuang also cited the Supreme Court’s 1976 ruling in Elrod v. Burns. “Here, as in Elrod, First Amendment interests were either threatened or in fact being impaired at the time relief was sought,” Chuang wrote. The plaintiffs, International Refugee Assistance Project, Iranian Alliances Across Borders and individual plaintiff Eblal Zakzok, were able to establish a likelihood of “irreparable harm” from the president’s order, the judge said. The absence of a family member specifically, he continued, “cannot be cured” through monetary reward. 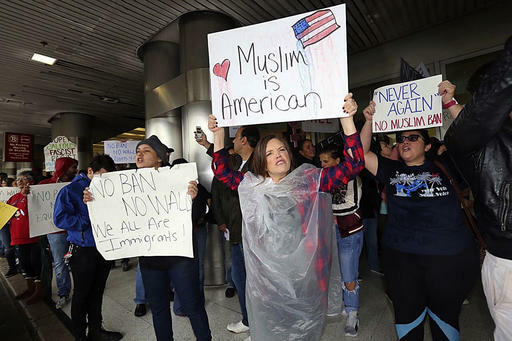 Omar Jadwat, director of the American Civil Liberties Union’s Immigrants Rights Project, issued a statement on Wednesday saying that the latest ruling supports his theory that the president’s travel ban is still prejudicial at its core and targets Muslims unfairly. “And like the two before it, this one is going down to defeat in the courts. Religious discrimination with window dressing is still unconstitutional,” he said. In a statement on Wednesday, Mana Kharrazi, executive director of Iranian Alliances Across Borders, a nonprofit Iranian civil rights outreach group, praised Judge Chuang’s decision. “When our members connect with family members, friends and community members from across the Iranian diaspora, it changes futures, enriches and lives and roots them in a meaningful sense of community and responsibility. Our youth spoke up in court and they won,” Kharrazi said. Echoing Chuang’s sentiments on impact the ban has on families, Kharrazi said the organization would continue to speak out against religious discrimination while “graduations, weddings and family gatherings will continued to be interrupted” and while some will continue to face harassment and hostility. The plaintiffs were represented by Covington and Burling LLP, in conjunction with the National Iranian American Council, Muslim Advocates and Americans United for Separation of Church and State.